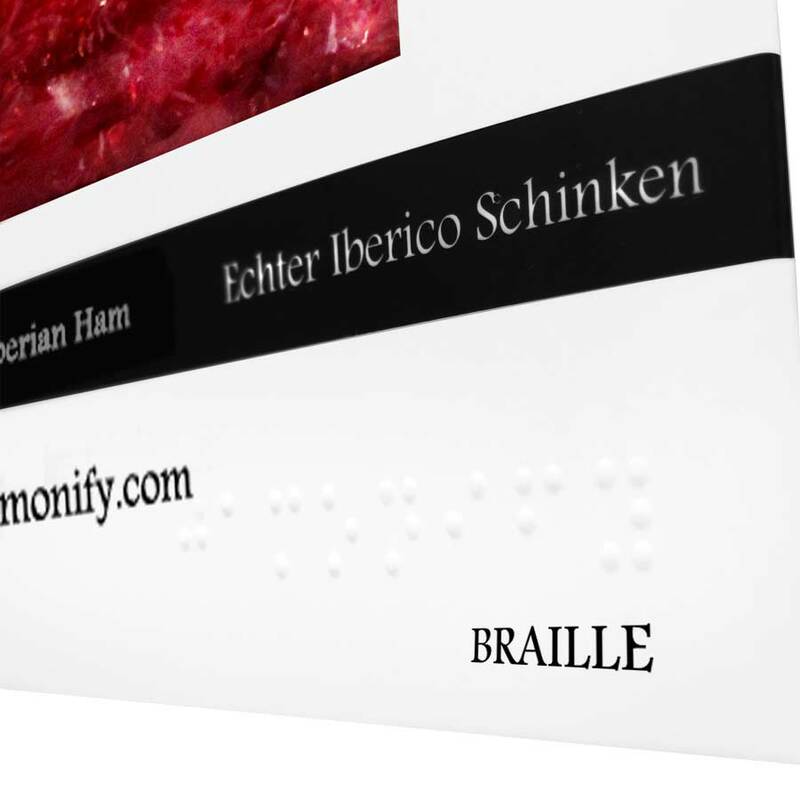 Jamonify, prides itself to be the first gourmet Iberico ham brand to offer its labels in Braille. At Jamonify, “The World’s Most Exclusive Ham” (“El Jamón Más Exclusivo del Mundo”), we have always been keen on developing our brand, paying special attention to visual impaired people. We know our Iberico ham makes any mouth to water just seeing it, so we thought we should able vision impaired people to use their hands to “feel” our ham. Any of us should be aware of the existence of a great number of visually impaired people, who need special labeling among other needs. These last months, we have been working with the Spanish Braille Comission, which belongs to ONCE (National Organization of Spanish blind people), to guarantee the perfect labeling of our brand in Braille. As always ONCE has been very supportive and their advice very useful for our Braille labeling. Jamonify is the first Iberico ham brand in the Word that offers in its catalogue Braille labeled products. Our greatest satisfaction is that visually impaired people can “see” Iberico ham through their eyes, that is their hands. From now on you Jamonify, will be the perfect gourmet gift for vision impaired people, as they will be able to distinguish the most exclusive brand behind the best quality acorn iberico ham. Jamonify is the perfect gift: delicious, highest quality Iberico ham and labelled in Braille. Often the main barrier are our lack of awareness about the needs of blind people.Therefore when we designed our brand and labels, we were thinking our values and qualities should be transmitted through all our senses including the tact, helping everybody, regardless of their accessibility level, to enjoy 100% all the good things Life offers and between them the exquisite acorn Iberico ham. We would like to express our warmest thanks for all their help to ONCE (National Organization of Spanish blind people).